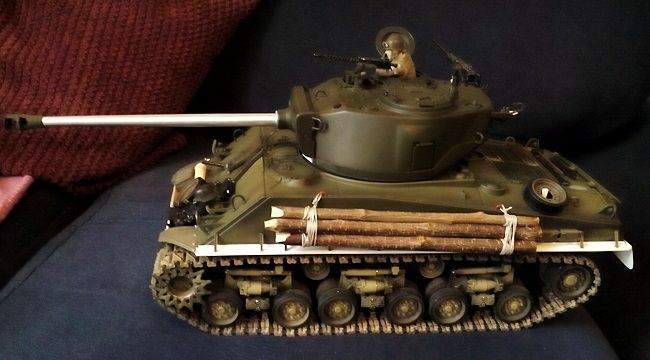 Morning all, has anyone bought the hooben fury Sherman yet? if so is it any good? According to what I have seen in forums, IMHO it does not worth it. I just picked one up over the weekend & its not bad so don't take what you saw over at RCU at face value - those are my photos posted a few days ago. Granted, its certainly not Tamiya grade but for the $200.00 I paid with TK22/MC6, I'd rate it above the basic HL & Trumpeter conversions & it outperforms the metal Mato M4A3 I have. It could use more weight & was told they have no idea when they'll release the planned metal upgrades. That said, Hooben is using MATO's gearbox so I'm playing with it now to see what I can retrofit between the assorted Tamy/Mato/Impact track & parts I have at my disposal. Will let you know how it goes. Xiaoshan_Sailor wrote: I just picked one up over the weekend & its not bad so don't take what you saw over at RCU at face value - those are my photos posted a few days ago. Granted, its certainly not Tamiya grade but for the $200.00 I paid with TK22/MC6, I'd rate it above the basic HL & Trumpeter conversions & it outperforms the metal Mato M4A3 I have. It could use more weight & was told they have no idea when they'll release the planned metal upgrades. That said, Hooben is using MATO's gearbox so I'm playing with it now to see what I can retrofit between the assorted Tamy/Mato/Impact track & parts I have at my disposal. Will let you know how it goes. Does the suspension compress or just pivot? Thanks stu, I'd seen else where said it was just pivot, feng showed videos with both so wanted to clarify!! Doesn’t look as good as a Tamiya one but then for under $300 I wouldn’t expect it to be. 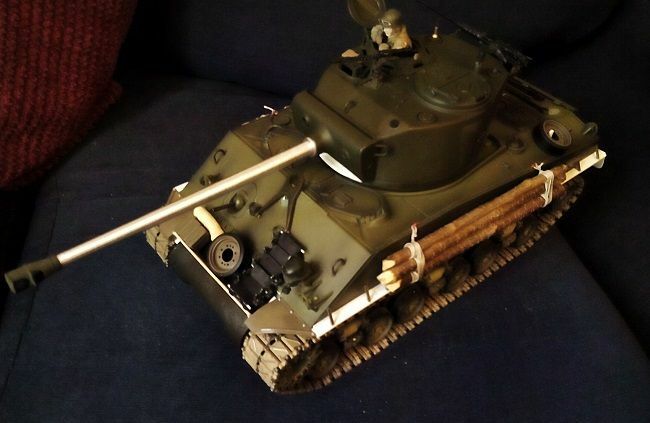 Make your own ...Tamiya Sherman lower hull, HL M4a3 top hull and modified Mato Turret. Hi all, I sent a message to Andrew haya and he says the suspension only pivots. Ad Lav wrote: Doesn’t look as good as a Tamiya one but then for under $300 I wouldn’t expect it to be. Ludwig von wigbearer wrote: Hi all, I sent a message to Andrew haya and he says the suspension only pivots. got my pressie yesterday tom, mine compresses ,but Andrews vid shows them pivoting so I must have got a later production ? Where's yours from Stu? Also nice to see you back posting on here. got it off Andrew tom ? Suspension most certainly compresses both shocks plus pivots. Mine is new production that I picked up Saturday at Hooben's workshop here in Hangzhou. I test fit a set of IMPACT T26 tracks to mine last night but am waiting to get metal drive wheels since dare not attempt anything except a short test run. Just curious, are the tires made of rubber? No idea when they'll hit the States & doubt they'll be offered as a kit. Didn't ask but its designed for factory assembly as you'd expect with any HL products. Regarding wheels, they're are all plastic. Perhaps MATO or someone else will noticed & see an opening for parts.